“BIKERS UP! RUNNERS UP!” If you hear this warning on a Saturday morning in Pebble Beach, pay close attention: you may soon witness an exciting and potentially dangerous encounter between two rival gangs of local endurance athletes. Cyclists and runners are the Monterey Peninsula’s version of the rivalry between West Coast and East Coast rappers. Both groups are enormously talented, but each one feels disrespected by the other. It’s like the Sharks and the Jets from West Side Story- we occupy the same turf, we have a hard time seeing the other group’s point of view, and we occasionally get into skirmishes. Once such encounter typically happens during each group’s Saturday morning workout, at a predictable time and location, so consistently you could probably set your watch to it. Remember the old word problems from high school math? Group A, consisting of about 60 bikers, starts at Portola Plaza in Monterey at 7AM, heading south into Pebble Beach via the Pacific Grove gate and 17-Mile Drive going 20 miles per hour. Group B contains 40 runners, starts at the bottom of Ocean Avenue in Carmel at 7:15 AM, heading north on 17-Mile Drive at 8 miles per hour. The question is: where do these two groups meet, and at what time? The answer is, about one half mile south of Bird Rock, at approximately 8:00 AM. But there’s much more to the story. Allow us to set the scene a bit. The runners park in Carmel, chat a bit, and then slip on their $100 Asics or New Balance shoes (purchased 3-5 times per year). They wear technical fabric clothing from Sugoi or Nike, along with $200 heart rate monitors or $300 GPS units, and start as a pack. The usual run is 12 miles; 6 miles out to Bird Rock and then back. The crowd gradually strings out into several smaller, similarly-paced groups. By the time the runners travel 5 miles to Cypress Point, there can be as much as two miles between the first group and the last. 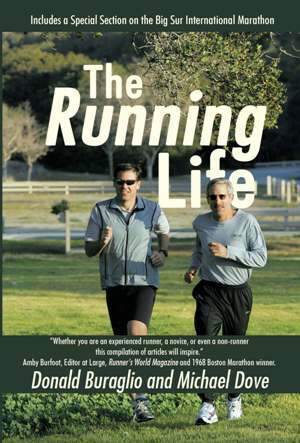 Conversation is rampant, but rarely about running- common topics are family, work, sports, or politics. The bikers park in Monterey, chat a bit, and then start out slowly on their $2,000 to $7,000 bikes (purchased once every 3-5 years) with names like Colnago, Pinarello, or Trek. They wear $200 Sidi or DMT shoes, and are decked out in bright colors like Cirque De Soleil performers in Castelli, Pearl Izumi, or Santini duds. The usual ride is 40 miles, and when the riders hit 17-Mile drive, the hammer is dropped, and the peloton breaks into 2 main groups with a few stragglers. The conversations early in the ride are usually about tires, bars and stems, and components. These discussions taper off in Pebble Beach as the riders concentrate on staying in a tightly-packed group while traveling at high speeds. So what exactly happens just south of Bird Rock? The situation is inherently problematic. Bicycle safety dictates that riders travel with traffic, on the right side of the road. Runner safety requires them to run facing traffic, on the left. Consequently, both groups are careening toward each other on the ocean side of the road. Consider that the road has almost no shoulder, many curves and hills, and is frequently foggy, and you get a sense of the potential danger involved. The hammering, fast moving, traveling circus of bikers pushes hard and hugs the corners. The experienced regulars start yelling, “RUNNERS UP!” even when runners are not in sight. The lead pack of runners, wanting to keep their footing on the asphalt, usually moves across to the right side of the road. The experienced runners yell, “BIKERS UP!” even when bikers are not in sight. Their paths finally cross, with the bikers yelling, “D**N RUNNERS!” as they whoosh by, and the runners yelling “D**N BIKERS!” as they glide along. When choreographed properly, injury and accidents are narrowly avoided for another week. Unfortunately, a few times a year the weekly meeting results in injury, and it’s almost always the biker who gets the worst of it. Runners can usually bail off the road one at a time, and they have the nearby ice plant to cushion their fall. When one biker goes down, he frequently takes the whole group with him in a heap of metal and blood and shredded Italian sportswear. It’s an ugly scene that nobody likes to see. Thankfully, the rivalry hasn’t quite reached Biggie vs. Tupac proportions – at least as far as we know, nobody has died in one of these altercations. There aren’t any of us who ever wish injury upon the other group. The bikers respect the runners and the runners respect the bikers. Both groups have a passion for their chosen activity. A lot of us have shared experiences in each sport. Many cyclists are former runners (we runners call this “turning to the dark side”) who find the non-impact cycling motion much easier on their joints. Many runners are former cyclists who got frustrated dealing with the equipment aspects of cycling- having to stay current with the latest technology, or getting dropped by another rider because he has better gear. Some of us are triathletes who spend time in both camps, and understand the perspective of each side. To the runners: understand that it’s very difficult for cyclists to stay in a close pack while traveling at high speeds on a dangerous road. Please make every effort to get out of the way. To the bikers: we’ll try to avoid you, but traffic conditions may not allow us to give you a whole lane of the road. Please use extra caution when riding past a long string of runners. Hopefully we can continue to share the roads without a major incident. Remember: BIKERS UP! RUNNERS UP!